Edgar Degas (1834–1917). Two words and a date range that make a pregnant, robust statement. One hundred years after his death, critics and art historians are still sifting through his eclectic collections, his abundant artwork, his impenetrable psyche, and yet still come up short in being able to categorize the phenomenon that was Degas. The Fitzwilliam Museum, Cambridge, and Jane Munro, its keeper of paintings, drawings and prints, have assembled quite an exhibition catalogue that pulls out all the stops to honor six decades of Degas’ work. Essays and images share space as Degas is considered from angles of geographic location, education, and experimentation, subject matter, mixed mediums, and legacy. The very first sentence of the introduction prepares the reader for what they are about to experience: “One of the defining characteristics of Degas’ art is its unpredictability.” Subsequent points and counterpoints confirm this claim beyond any refute. As a stand-alone force, Degas was classical and forward thinking, disciplined and capricious, obsessive and indifferent, innovative and traditional, critical and supportive, hard working, and an intellectual dandy. It was never an either-or scenario with Degas but rather both-and. He was both controversial and admired and remains so to this day. It may seem at first unusual that the Fitzwilliam Museum, a British venue, would be taking the lead in such a project. Degas, after all, was a Parisian through and through. The “Degas and England” essay by Richard Kendall addresses some of this history by explaining how open England was at the time to receiving Degas’ artwork, while in France it was surrounded by outrage in the midst of the Impressionist artistic revolt. Following the lead of artists such as Winslow Homer and James Tissot, and art dealer Paul Durand-Ruel, Degas balanced his business between both sides of the channel. In the end, it was the Fitzwilliam that found itself with both a dominant collection and an occasion to flaunt it. So why all the fuss about pastel drawings of dancers? There exist hundreds and hundreds of such drawings, why are Degas’ special? In the beauty of an essay, “Degas, Classicism, Dance” by Jill DeVonyar, a former ballet instructor and independent curator specializing in dance history, the graceful confluence of ballet, classical dance, drawing, and Degas makes total sense. The sensitivity of a mid-career minded hunt for a change of scenery, change of subject, and change of style found Degas with a distinguished lifetime supply of material manifested in both sketch and sculpture. As he aged and his sight withered, Degas came to rely more heavily on the tactile responsiveness of wax modeling. Serving as an outlet for his restless creative energy and the sheer pleasure of manipulating the medium, these temporary specimens were never intended for public consumption. Not until after his death did Degas’ dance figures see the light of the galleries. A few of the sculptures also saw the light of the X-ray machine when the Fitzwilliam took its three colored beeswax figures and subjected them to radiography. These images reveal just how haphazard was Degas’ process as he would insert unconventional fillers and foist makeshift repairs upon his model armatures. The technical summary included here is but one brief yet stunning page held out as a treat for the reader just before the concluding chapter and is not to be missed. As Degas continually referred to his idols, Ingres and Delacroix, and the variety of artists he fervently collected, so too do many accomplished artists owe a debt of gratitude to Degas. Anna Gruetzner Robins’ “After Degas” article highlights British artists such as Walter Sickert (1860–1942) and Henry Moore (1898–1986) who admired and adapted styles from Degas. Francis Bacon (1909–1992), Lucian Freud (1922–2011), David Hockney (b. 1937) also attribute artistic influence to Degas. Surely Degas’ greatness continues today with even more widespread tendrils, regardless of how few artists Robins identifies as living legacies. 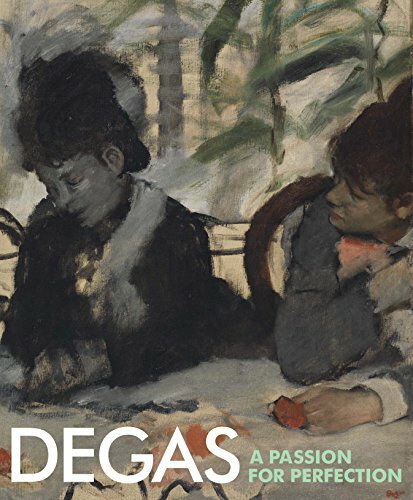 The Fitzwilliam Museum would be remiss to assume such limited exposure in the younger generations of artists and wisely offers up a continuation of the Degas conversation with their traveling exhibition and an excellent Degas: A Passion for Perfection catalogue.